Drew Angerer/Getty ImagesA fit-and-trim Terry Myerson in May, 2018. 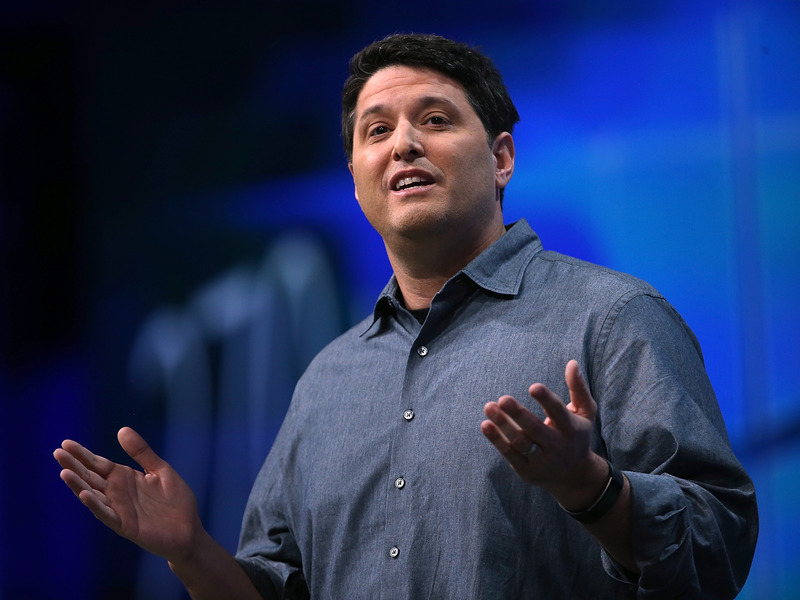 When former Microsoft exec Terry Myerson left his high-powered job at Microsoft, he wanted a new challenge. And he decided doing a 70-mile (113km) triathlon in Hawaii was it. 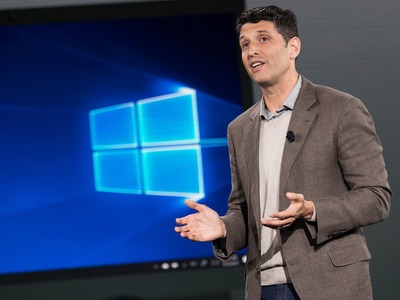 Myerson is now exceptionally fit and trim, but a few years back, his job was so intense and stressful, and he was so out of shape, he considered quitting Microsoft to get healthy, he told Business Insider. Instead, he made one simple change: he started doing walking meetings with his team, rain or shine. That change led him to push himself physically in ways he didn’t think were possible. Earlier this week, former Microsoft bigwig Terry Myerson stepped back into the public eye six months after leaving his job at Microsoft. Myerson published a cheerful blog post on LinkedIn that explained his new career move (he’s joining two investment firms) and wrote about all the fun things he’d been up to since leaving Microsoft after a high-level, 21-year career there. One of those things, he proudly wrote, was that he had completed a half Ironman triathlon race in Hawaii. A half Ironman is a 70 mile race consisting of a 1.2 mile ocean swim, followed by a 56 mile bike ride (aka a “half century” ride) and a 13.1 mile run (a half marathon). It took Myerson 7 hours to complete it, and “I couldn’t move the next day,” he told Business Insider. Such a race is no joke even for the fittest of the fit. But Myerson’s participation is even more notable because, just a couple of years earlier, he wasn’t fit at all. He hadn’t always been heavy, but as his career rose, so did his weight. There came a point during his time running the Windows team when he was so out of shape thanks to the stress and demands of his job, that he considered quitting Microsoft because of it. “There’s a saying ‘pizza is the taste of shipping.’ We shipped a lot [of new features] and we ate a lot of pizza,” he said. “I got heavy. I got to this point where I thought, ‘I have to get healthy or stop working. I need to leave Microsoft so I could get in shape,” he said. And that’s when he made a simple change: He turned all of his regular meetings into “walking meetings,” even in Seattle’s famously yucky weather. He had several routine 1:1 meetings a day and he did them outside, walking around the campus. And then he created a new rule: any meeting that didn’t need a whiteboard had to be done outside, walking. A “walking meeting with Terry” became a thing. “People started coming to meetings with jackets. It was fun. It got to be a culture for the group,” he said. He wasn’t walking all day long, but the walking time quickly added up. “The primary change I made that got the momentum going, it was really that I started to walk, a couple of hours a day,” he said. And then, engineer that he is, he did the maths. Walking a couple of hours a day burned more calories than sitting. But walking counted for double because it also helped him eat better. “It’s easier to eat healthy when you’re active. You’re not sitting there at your desk snacking on peanut M&Ms,” he said. That one change was enough for him to start seeing progress in his weight and how he felt, which encouraged him. He bought a Fitbit (now he wears a Garmin) and learned that by walking 15,000 steps, “I was burning 3,000 calories a day with all the walking,” he said. It was still a leap, so to speak, from walking meetings to finishing major endurance races. For that part of his transformation, he credits his guilty pleasure, the TV show “Breaking Bad” and its spin-off “Better Call Saul.” All told, the franchise has more than 100 episodes, and Myerson made a grand bargain with himself: He could only watch the shows while on the treadmill or elliptical at the gym. 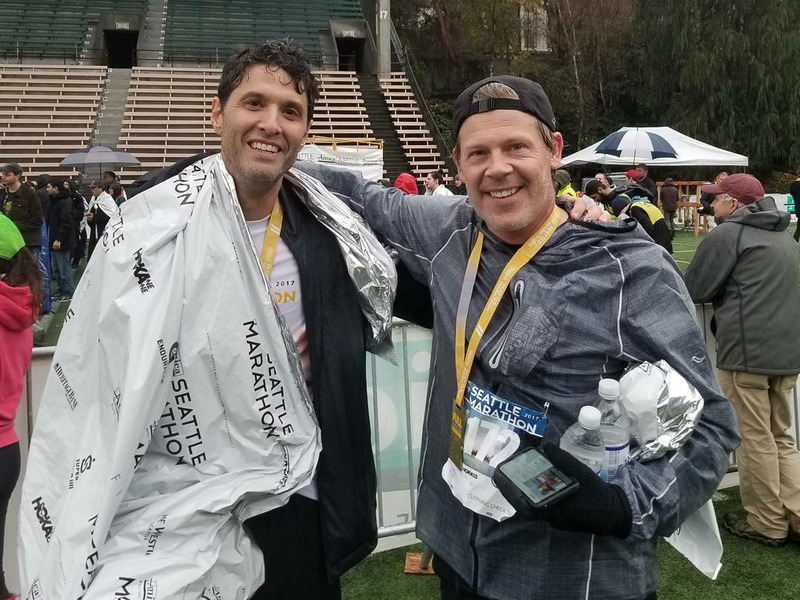 Terry MyersonTerry Myerson (left) and Nick Parker (right) after completing the 2017 Seattle Marathon together on a dare. He couldn’t help but binge-watch the series. “I had the Surface Pro on the elliptical and I just watched episode after episode,” he said. As he got in shape, he started running outside and entered in a few races. After he completed a half marathon, a 13.1 mile race, he felt pretty pleased with himself until he spent an evening with Nick Parker, the vice president of Microsoft’s OEM sales. At some point that night, Parker challenged him to run a full marathon, 26.2 miles. He was amazed at himself when they completed it together, too,and tweeted that he had to spend the next day working in his socks. “My feet are too sore for real shoes,” he wrote. The idea of doing a triathlon was planted in his mind while he was still at Microsoft. He went to Hawaii to help Qualcomm with a big press conference, which also happens to be where the most famous triathlon race, the Hawaii Ironman, takes place. He met some people who participated in it and it piqued his interest. “Simply put, when I left Microsoft, I felt like I wanted to take on a challenge, and that was it,” he says. Not only did he finish the race, feeling once again proud and amazed that he did, but he said that the training changed him. Myerson was known at Microsoft as a tough, hard-pushing boss, who expertly navigated Microsoft’s famously political landscape. He confessed that “The hours of training helped reset the impulses in my brain to a more relaxed cadence (probably akin to doing several hours of meditation per day),” he said. All told, he says he’s lost over 40 pounds. His advice to anyone with a stressful job that has contributed to weight gain, lack of exercise, and other unhealthy habits is this: Start by simply walking during the day as much as you can. Then find an irresistible TV show with plenty of episodes and take it to the gym. If you binge-watch them all on a machine, by the time you’ve finished the series, you will see progress. Finally, don’t be afraid to challenge yourself by signing up for events that you don’t think you can do, train for them, and challenge a buddy to do them with you. All this is better than “sitting in the office, snacking,” he said.